Which sounds more ridiculous? Wolverine being a mutated wolverine, or the result of a bizarre experiment to create a character who would convince Canadian kids that Marvel Comics cared about them? The first almost happened, and the second...? Well, that's how Wolverine really came about. Despite being best-known as a member of the always-uncanny X-Men, Woverine actually started life as an antagonist for the Hulk in 1974's Incredible Hulk #180. Created by Hulk writer Len Wein and Marvel's art director, John Romita, the character was less a moment of divine inspiration than the much-discussed solution to the problem of how to help break the Canadian market; then-editor in chief Roy Thomas had asked Wein to come up with a new Canadian character, and he'd already come up with two possible names: Badger and Wolverine, both animals that lived in both the US and Canada. The Wolverine that appeared in Hulk was different from the one we've grown to love - or, at least, tolerate. For one thing, he was originally going to be a teenager whose claws were attached to his gloves whose only powers were increased senses and agility. Even by the time that he was drafted into Marvel's revamped X-Men a year later, his origins were in flux; X-Men artist Dave Cockrum remembered plans to reveal that Wolverine wasn't actually human at all, but an actual wolverine that had become mutated enough to walk and talk like a human (That plan was, thankfully, nixed by Stan Lee). 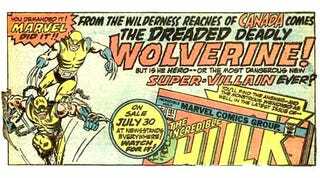 In fact, Wolverine's origins were left intentionally vague for the first seventeen years of his existence at the behest of X-Men writer Chris Claremont; he claimed to have a plan for where and when he was going to reveal it, but someone else beat him to the punch. 1991's Weapon X (by Barry Windsor-Smith) was the first stab at explaining Wolverine's origin, showing readers just how Wolverine ended up with a metal skeleton in the first place. Even that didn't explain everything, however, and those waiting to see more had to wait another decade. With the character still maintaining a fanbase despite Marvel's other misfortunes (including, but not limited to, bankruptcy and almost destroying the comic book direct market due to an ill-considered distribution scheme), new Marvel bosses decided at the turn of the century to go for broke in an attempt to create an event so big that everyone would pay attention - and, more importantly, buy their comics. Origin, a six issue series written by Paul Jenkins from a plot by Jenkins, Marvel editor in chief Joe Quesada and Marvel president Bill Jemas, didn't just reveal Wolverine's true age, it also hinted at the truth of his relationship with longtime nemesis Sabretooth (half-brothers) and showed the first time Wolverine discovered his powers... which, in true tragic fashion, were to avenge the death of the man he thought of as his father by killing his birth-father. The series was a sales success, and spawned an ongoing series spin-off, Wolverine Origins, which continues to explain the character's long-abandoned past. That doesn't mean that someone can't come around and add some new wrinkles, of course. And that's what Heroes' Jeph Loeb did in 2007, when he revealed that Wolverine just might be part of a subsection of humanity that evolved from animals other than apes... making him, potentially, a mutated wolverine after all. Some ideas, apparently, can't even be quashed by Stan Lee.